I'm in the design process on a cabinet that'll be made of 1 1/8" thick Sapele. I want to use a sliding dovetail to attach the main shelf inside of it which will measure roughly 15" in width and is 40" long. 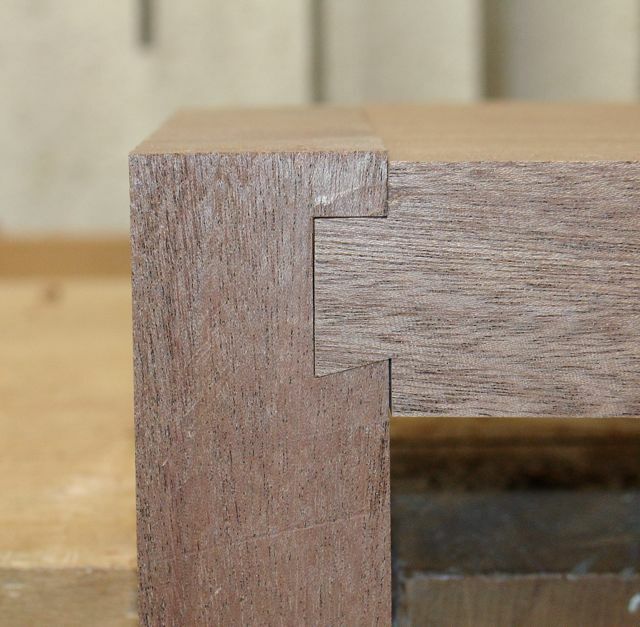 When I look at this joinery many recommend making it a tapered, sliding dovetail but this seems like more of a challenge seeing the size of the pieces. My thought is to make the joint itself as close to tolerance as I can and not use any glue until the final 2" or so. Because of the complexity of this piece (sliding doors) I'll probably need to be able to assemble and reassemble several times. I would use liquid hide glue to minimize the fibers swelling up and causing binding but never having made a sliding dovetail of this length before am looking for advice -- anyone have experience with this type of assembly? Appreciate any suggestions. The reason everyone is recommending a sliding tapered dovetail is that getting a flawless fit for a sliding dovetail is quite difficult if you want to knock it apart several times (how hard are you pressing on the piece as it slides passed the router bit, how fast, vibration, etc.). I would take the time to do the tapered. I guess this is an heirloom piece? I'm starting to re-think this and am considering a half dovetail combined with a dado. The dovetail at the bottom would give me mechanical strength while the dado would allow me to fine tune the fit with a plane. Trying to taper that size of a shelf seems to be a hassle! finewoodworking did an article on a tapered sliding dovetail a few years back. as I remember it wasn't all that difficult. somehow the taper was related to the thickness of masking tape. might do a search. Hi Brian, you're right about that article in FW. I've researched their on-line files and found a few references too. Garret Hack just did a audio slide show as well but the problem I have is the size of my shelf (1 1/8" x 15 x 40 or so). I've put a link to that in this response. I'll be trying out my barefaced dovetail and posting it on my blog if --- finger's crossed! ; my thoughts are right and it works. John, When I do large ones, I try to set the fence to get a perfect fit all the way across on the first pass. Then I move the fence over about the thickness of a business card, and run it again, taking off that few thousandths with a business card folded around the front edge, which gives it a very slight tapper. Then I like epoxy for this joint, which gives plenty of open time, as well as acting like a lubricant, making it much easier than dry fit. It is also good from bridging a gap back where the joint will be a bit looser. Glue the whole thing; forget about any taper; think it through so you won't have to disassemble; wedge the dovetail from both ends.